Child-friendly? This is a young-adult favorite, but beware, as it features gladiator-style battle sequences that small children may find disturbing. If you've never heard of Suzanne Collins' The Hunger Games trilogy, the immense hype around this film likely came as a big surprise. All of a sudden, teenage (and post-teenage) girls and boys around the nation seem to be losing their collective minds over this apparent adolescent gladiatorial beauty pageant from hell. Why, you ask? Well, among the many answers, it seems that people: 1) really miss Harry Potter, 2) are unsatisfied with Twilight's bestial love triangle and 3) are looking to latch onto the next major young adult novel/film franchise. Set in a dystopian future, an apocalyptic catastrophe has collapsed civilization as we know it, resulting in the rise of a new North American nation called Panem (like the airplane company?). Comprised of 12 districts, Panem hosts a yearly spectator competition known as the Hunger Games where 24 teens are forced to fight to the death – punishment for a previous rebellion against the oppressive regime. To spare her sister this grizzly fate, 16-year-old Katniss Everdeen – played by the oh-so-fine Jennifer Lawrence (hey, she's 21, so we're not going to apologize for that one) – volunteers to fight in her place, prompting a girl-powered rebellion against injustice, oppression and…you know…being forced to kill each other – typical teen stuff. Anyone with knowledge of film history can tell you this story has been done before – Arnold Schwarzenegger's cheese-tastic film The Running Man and Japanese teenage gore-fest Battle Royale are among the most recent. However, The Hunger Games is actually a decent adaptation of an equally entertaining young adult novel. 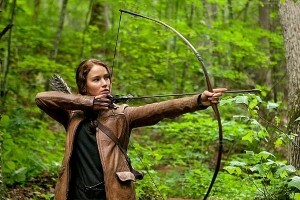 The teen appeal is obvious in star Jennifer Lawrence, and younger kids will be equally captivated by the exciting combat and archery (Katniss favors a bow) sequences. It's also encouraging to see a strong young woman as the main character and role model, despite her rising body count. But hey, kids have to have heroes – even the reluctantly bloodthirsty kind. Child-friendly? It seems that the Hunger Games is poised to be the next Harry Potter, so expect your kids to be obsessed with its pretty young heroine, teen-on-teen violence and futuristic dystopia for the foreseeable future. Common Sense Media gave the movie a "Pause 13+" rating, meaning that parents should consider children's personalities and maturity levels before making a final decision. The violence may be too much for some little ones, but that's up to you.